Jocelyn's Provisions - This pretty little cafe in Fortitude Valley loves Easter baking. “Our bakers have been testing, mixing and baking to ensure our hot cross buns are as delicious as ever”, their Facebook page says. Their traditional-style buns are made with plump fruit, candied peel and are brushed with a sweet sticky glaze. Their customers describe the buns as dense, warm and fresh. The cafe also sells baked Easter egg-shaped treats, cakes and extravagant Easter eggs filled with chocolate mendiants (a traditional French confection). Chester Street Bakery - Known for their elaborately sweet and colourful deserts and incredible cakes, Chester St Bakery also does traditional hot cross buns. Unlike a traditional bakery, this store in Newstead is one of Brisbane’s best late night dessert bars – so if you’re feeling like the Easter treat later at night, this may be the place to try. Flour & Chocolate - This bakery is a favourite in Brisbane for its unique pastries and breads. Their hot cross buns are baked with 100% organic flour and according to the Visit Brisbane website, “are filled with raisins, sultanas, cranberries, apricots, figs, glace cherries, glace peel and topped with a traditional iced cross.” The bakery often announces its specials via Facebook, so keep an eye out for any unique flavours they may bake in the lead up to Easter. Couverture & Co - If you’re torn between buying a hot cross bun or Easter chocolate, Couvertue & Co in Red Hill makes the perfect hybrid of the two. 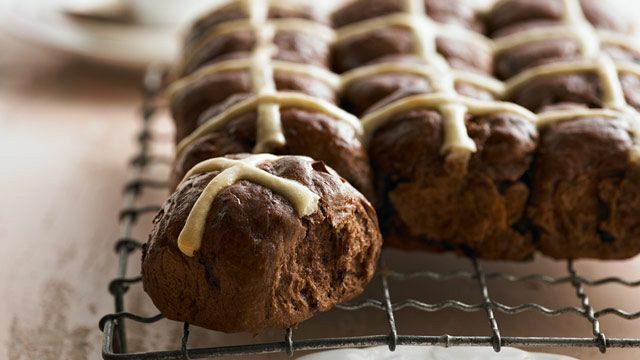 Their ‘hot cross truffle’ is made from milk or dark chocolate, filled with a chocolate ganache plus all the best bits of a hot cross bun – raisins, cinnamon and spices. Brewbakers - Brewbakers is an artisan bakery in Alibon, Brisbane. Baking fresh goods every day from hot croissants, sourdough and rolls for lunch, this bakery has got a reputation for being worthy to drive across town for. They’re also baking hot cross buns all holiday season, which customers say are some of the best you’ll ever taste.